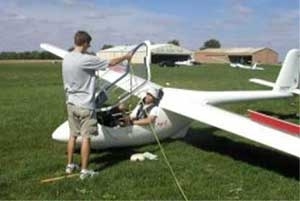 Our glider club currently owns and operates 4 gliders and 1 tow plane. We have two 2-place gliders and 2 single seaters. Waiting for a glider to become available is seldom an issue. 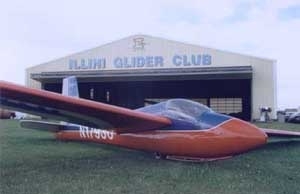 IGC also hosts several member-owned gliders as well. This workhorse has more than enough power to easily launch a fully loaded two seat glider quickly and efficiently. This 'ex-crop duster' is a low wing tail dragger powered by a six-cylinder engine. 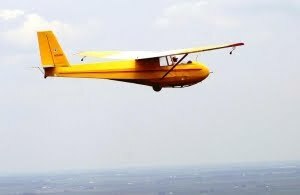 The Schweizer 1-26 is a very popular American glider built from 1954 to 1979. Its docile flight characteristics make it ideal for solo students transitioning from the 2-33, while its agility and low stall speed allow it to circle tightly in the core of thermals. Many IGC pilots have earned their Silver Badge in the ship, and cross-country flights of over 100 miles have also been logged. Its low landing speed and effective divebrakes make it very safe for off-field landings. The PW-5 glider is a winner of the World Class Glider Competition, organized by Federation Aeronautique International (FAI). The competition requirements were simple: Safe Design coupled with Good Performance. The design of the PW-5 glider was developed by a team of scientists and students of the Technical University of Warsaw under the supervision of Roman Switkiewicz. There were 42 designs from 20 countries submitted at the first stage of the competition. Only 7 gliders reached the final stage (comparative tests) in Oerlinghausen Gliding Center in Autumn 1992.